These little puppies pack a punch, whether its shells for a blunderbuss, grapeshot for a cannon, arrows for the archers, or a pirate's dream in gold. 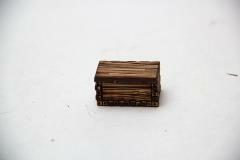 These little crates are great for your goods. This set includes four Ammo Crates, each of which are roughly 1" by 1/2" by 3/4".